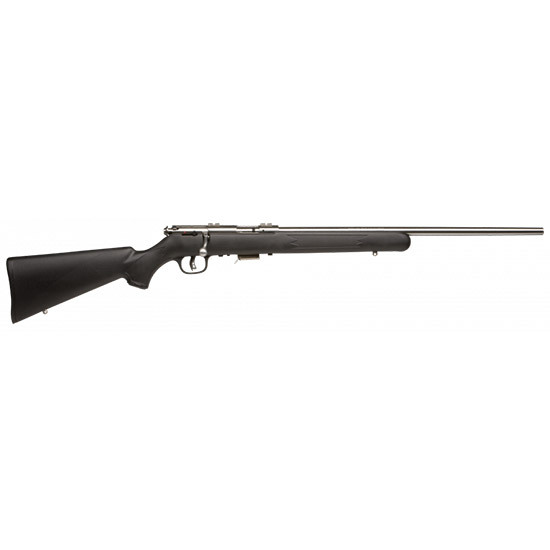 Savage 24700 Mark II FSS Bolt 22 Long Rifle (LR) 21 10+1 FOF Synthetic Black Stk Stainless Steel in. Mark II rimfire rifles offer fun shooting coupled with safety for novices with this bolt action. AccuTrigger is a standard feature offering a useradjustable trigger pull and also provides a crisp clean trigger pull which enhances accuracy. The Mark II FSS model has a button rifled 21 stainless steel barrel paired with a rugged matte black synthetic stock and a 10round detachable box magazine. It is drilled and tapped for scope mounts with open sights and a fiber optic front."